The goal of this project was to launch a high power rocket from a high altitude weather balloon. Initially the motivation was to gain some hands-on engineering experience for my resume, but as the project moved forward it took on a life of its own. I began to simply enjoy working on it - it was rewarding. The most rewarding part of the experience wasn't putting it on my resume - my initial goal - but being able to see the Earth from a new vantage point. Unfortunately, after several balloon launches and rocket flights, I came to the conclusion that I was not ready to finish the project on my own, and have decided to shelve it until I either have more time, or can find a solid group of people who want to participate. In the meantime, I will be updating this page with the work that I have accomplished thus far, including design drawings and some hardware that was manufactured for use in the rocket. My basic approach to this project was to tackle each component individually through various skill-building exercises. The first thing I tackled was the electronics part, since I'd had some experience working with Arduinos and there is a good amount of documentation online about how to build the electronics component. With that working I moved on to launching some balloons. It was really tough at first, and the first launch went rather poorly, but the second one went much better! With some solid ballooning experience behind me, I moved on to rocketry. I bought a kit just to understand how amateur rockets are built, and launched it a few times before modifying it, using the knowledge I had gained from building it in the first place, to be able to house some of the electronics I had used in the balloon flights. At this point, I knew about ballooning, I knew about rocketry, it was time to start putting the two together. I designed a rocket from a clean sheet of paper, with the help of some rocketeers, to house all the electronics I needed and to be compatible with both launching from a balloon and from the ground (for testing purposes). The plan going forward was/is to just go piece by piece - assemble the electronics, verify them, assembled the rocket, launch it from the ground, resolve any potential issues, and then send it up on a balloon and launch it! Be reusable - not so much because I might want to launch it again, but more because it will be easier to work with it between ground testing and actual flight. There's always the possibility that more than one ground test will be required as well. Software-wise we need to be able to account for a number of contingency scenarios that most typical balloon flights do not need to account for. For example, since most high altitude balloon flights fly with the parachute already deployed, they don't need to worry about premature separation of the payload from the balloon - the parachute is already deployed. In our system, the parachute is supposed to deploy after a successful rocket flight, but what if, for whatever reason, we detach from the balloon on the way up? The parachute needs to deploy without the rocket firing. Be able to reliably release from the balloon - if we can't release from the balloon, we're going to have a bad day. I'll go through each of these requirements one-by-one and explain the solutions I came up with. This goes into the general design of the rocket. There would be two sections - a booster section which would house the motor and all of the electronics, resting on top of the motor, and a parachute section which would contain all the recovery equipment. The two sections would be attached via friction fit and masking tape before flight. The way the electronics housing was designed, this would allow testing and configuring the electronics on a table top and then simply slipping them into the booster section, attaching the balloon to the release mechanism (which would sit at the top of the electronics housing in the booster section), and then slipping on the parachute section and securing it all with masking tape. This was just a proof-of-concept. In the final rocket, there would be a piece of equipment on either side of the bulkhead and 3 or 4 really long (>12") threaded rods going through the entire thing, with nuts in place as appropriate. This one is fairly easy, since the systems for ground launch and balloon launch could both be on the rocket at the same time. For ground launch, a pair of "launch lugs" would be attached to the side of the rocket for use with a launch rail. And for balloon launch, a wire would come down through the nose cone of the rocket and attach to a barrel bolt located inside the rocket. In order to re-use the rocket, we would need to be able to replace expendables (rocket motor, ejection charge), reconfigure the electronics (pull data from previous flights from the storage medium, reprogram the flight computer, swap out batteries), and repack the parachute. With the design discussed above, all of these are easy except for replacing the ejection charge in the parachute section. The difficulty comes from the requirement that the expanding gases from the ejection charge are all directed at pushing out the nose cone of the rocket (which would be friction fit onto the parachute section). If enough of those gases leak below to the booster section, the nose cone might not come off, and we would have a pretty bad day. So there needs to be a tight seal which can be disassembled and re-tightened relatively easily. In order to solve this problem, I decided to use a 2-part system using tapered thread. One part, the female part, would be epoxied into the parachute section, and the other would thread in and out of that female part. However, since no standard tapered thread existed that met the dimensions of my rocket, I had to come up with my own. Thankfully I was working in a machine shop at the time, and had the tools to create my custom threaded parts, as seen below. The left piece would be epoxied into the rocket, and so would be a permanent fixture. The right piece has a bolt on the bottom epoxied into it, for use in torquing it into the female part. A hole would be drilled in the right part to allow the balloon connection through. The hole would be sized small enough so that when the ejection charge blew, the pressure drop across the hole would be negligible. 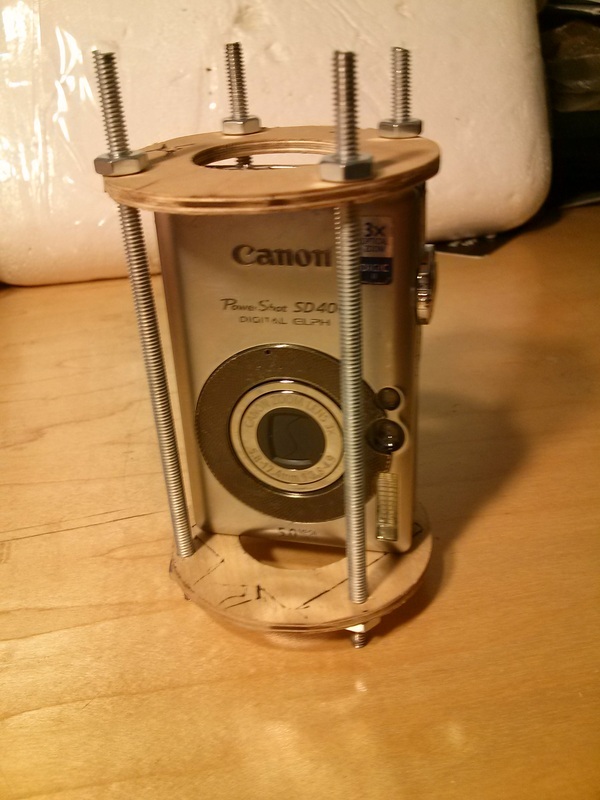 Then the ejection charge container would be placed on top of the right piece, probably epoxied in as well. And there we have an easy-to-repack system for the ejection charge! 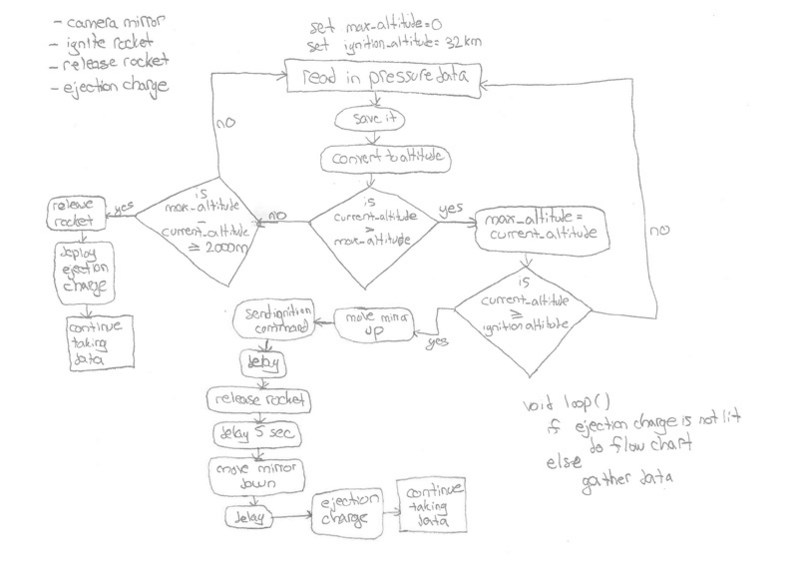 The software running on the flight computer is described in the following flow chart. The microcontroller would most likely be an Arduino or something similar. In the language used by arduino, the main code is put in a function which loops indefinitely called "void loop()". From there the software would determine whether or not the ejection charge had been lit and then perform the corresponding routine. The mirror referred to in the flow chart would be attached below the video camera on the outside of the rocket. It would just be a small mirror attached to a servo that would rotate upwards before launch in order to allow the video camera to "look upwards" and record footage of the launch from that perspective. If anything went wrong, that sort of footage would likely be invaluable. In fact, it would still be pretty cool if everything went right! In order to release from the balloon a number of options were considered, including nicrome wire, cutting the rope, and a barrel bolt mechanism. Ultimately the barrel bolt won out (for now) primarily because it seemed the most reliable. Nichrome wire could work just fine, but there was concern about how long it would take for nichrome wire to burn through the attachment line. Too quickly and our rocket would be falling while igniting, bad. Too slowly and our rocket would be carrying the balloon with it, also bad. Cutting the rope could work, but in order to be reliable there would probably need to be another mechanism to keep the rope taught, that would need to release once the rope is cut, which might be difficult to ascertain. A servo-actuated barrel bolt solves both of these problems. It will always take the same amount of time to release, and is fairly quick, which is also good. The primary risk that I see with the barrel bolt is if the connecting line gets caught on the bolt somehow. I think this could be solved in various ways, but this will have to be determined once I get around to testing.